Richard Henderson, from the LMB’s Structural Studies Division, has been made a Companion of Honour in the Queen’s 2018 Birthday Honours list, for services to electron microscopy of biological molecules. The Order of the Companions of Honour was founded in 1917 by King George V and is awarded for a major contribution to the arts, science, medicine, or government lasting over a long period of time. The Order consists of the Sovereign and a maximum of 65 members. Membership confers no title, but those inducted into the Order are entitled to use the post-nominal letters CH. Richard is a structural biologist, with a physics background. 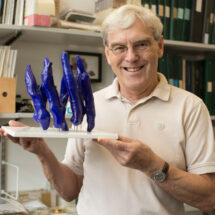 He has been at the LMB since 1966, when he started as a Ph.D. student in Structural Studies with David Blow. He was joint Head of the Structural Studies Division from 1986-2000, and then LMB Director from 1996-2006. For the last 20 years, he has been working to improve the methodology of single particle electron cryomicroscopy (cryoEM), which has recently reached the stage where it is possible to obtain atomic structures of a wide variety of macromolecular complexes routinely without crystals. In addition, he helped to develop the method of “conformational thermostabilisation” that allows any membrane protein to be made more stable while at the same time retaining a chosen conformation of interest. This helped the crystallisation and structure determination of several G protein-coupled receptors (GPCRs). With help from MRCT, now LifeArc, this led to the founding of the MRC start-up company Heptares in 2007. Heptares now has ~125 employees and is wholly owned by the Japanese company Sosei, developing new drugs for medically important GPCRs. During his career Richard has actively supported science across the UK and the rest of the world, including being a member of the MRC Council from 2008-2014. He has been recognised many times for his work, including being elected a Fellow of The Royal Society in 1983. Most recently Richard shared the Nobel Prize for Chemistry in 2017 for developing cryo-electron microscopy for the high-resolution structure determination of biomolecules in solution. Richard commented “It is a great honour to be named as a Companion of Honour, following in the footsteps of other LMB scientists and my undergraduate teacher from Edinburgh, Peter Higgs.” Previous members of the LMB bestowed with the honour include Sydney Brenner, Max Perutz, Fred Sanger, César Milstein and John Sulston.